Jane Green is January's monthly feature for more info on Jane Green Month click on the link below. I would like to thank Jane massively for taking the time out to answer these questions and for offering a signed copy of Promises to Keep for one lucky reader. I know everyone really appreciates it as much as me. Now without waiting any longer below is the INTERVIEW WITH JANE GREEN!!! YAY!!!! & all the details for the giveaway! 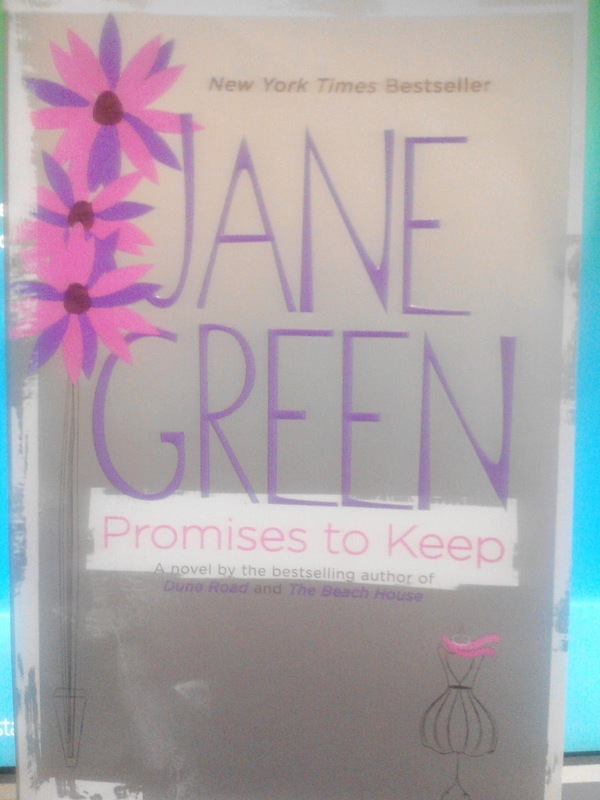 Promises to Keep is your latest novel Can you tell my readers abit about it? (It is called The Love Verb in the UK). It was inspired by my own experience of looking after one of my best friends when she was diagnosed with breast cancer, and is really about the lessons I learned during that short and heartbreaking journey - what it means to love someone. Do you like the way your UK/USA book covers are different and do you have a preference? I have never had a strong preference, although I recently received the cover for my new book in the US, which is completely different to anything I have ever had before, and it is the most beautiful cover I have ever had. Do you think the front covers of books need to be as capivating as the story itself? Unquestionably. Faced with hundreds of books in a bookstore, you automatically gravitate to the ones with covers that are compelling or speak to you in some way. What inspired you to become a writer? I was a huge reader as a child, and developed an enormous love of words, and of the ability we have, as humans, to escape and lose ourselves entirely within the pages of a wonderful book. You have wrote many fantastic books which has been the most challenging to write? The Love Verb was the most challenging emotionally, but Girl Friday was the hardest, only because I was attempting to inject more mystery and suspense, and I got so bogged down by the complications of the plot, I lost my way with the characters, and their emotional journey. I love reading your books and even over again, did you enjoy writing them as much as we (the readers) love reading them? I have the greatest job in the world, and I love it, but some books have definitely been easier than others. The Beach House and Jemima J were perhaps the easiest, only because the characters felt so real to me, I missed them for ages afterwards once I had finished writing. What book are you currently reading? Untold Story by Monica Ali – a novel that deals with the fictitious premise that Princess Diana did not, in fact, perish in a dreadful accident, but escaped to live an anonymous life in a small suburb in America, and re-reading Perfection by Julie Metz. Who are your favourite Authors? Armistead Maupin, Jonathan Tropper, Barbara Trapido, Jane Gardam and Cathleen Schine. For aspiring Authors out there is there any advice you could give them? Write the book you want to write, not the book you think is going to sell, and finish one book before you start another – anyone can start a book, but finishing it is the hard part. Last question can you tell readers one random fact about yourself? If I had a choice, I would be in bed, lights out, by 9 every night. Sad, but true. What did you think of the interview? Have you read any of Jane's books? which one is your favourite and why? 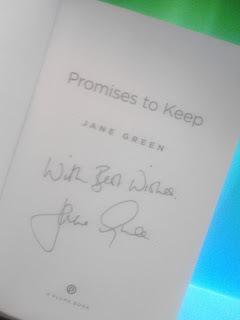 Jane has kindly offered one lucky reader the chance to win a sighed copy of Promises to Keep. (As seen below.) To be in with a chance of winning just read on. 13 January 2012 ~ 31 January 2012!! *Leave a comment below with your GFC name & email address so I can contact you if you win. Please leave direct links and Facebook/Twitter names. If you are a book blogger you might like to take part in my weekly event Get to know your blogger (Click Here) for more info or click the tab at the top of the page. Thank you so so much for the giveaway! The book looks so beautiful! I would love to read PROMISES TO KEEP thank you. Thank you for the giveaway! I would love to read this book! Following Jane on Twitter and Facebook! Really want to read this one! Love Jane Green! I already "like" Jane's FB page!